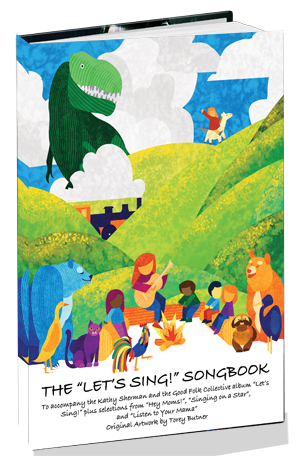 The “Let’s Sing!” songbook is a collection of “good folk” songs: all of the songs found on the “Let’s Sing! ” CD; as well as selected songs from Hey Mom!’s “Listen to Your Mama” and “Singing on a Star” . I’ve included simple chords in the same key as on the albums so even beginning musicians can play along on guitar, ukulele, autoharp or piano. Of course, drums, harmonicas, banjos, kazoos, and bagpipes are always welcome to add their voices as well. “Let’s Sing!” is a collection of some of my very favorite songs I sing with my pre-school children and their parents. Jenny Jenkins — an old musical game where one singer suggests a color and another singer must come up with a rhyming word. I’ve re-imagined this as a dialog between a mother and her daughter trying to get dressed in the morning. Waltzing with Bears— We all have that particular person in our lives, the eccentric cousin, the black-sheep sibling, but probably none quite so “interesting” as dear Uncle Walter. The Marvelous Toy by Tom Paxton — a wonderful and whimsical song about a not quite describable toy. Skinnamarink by Felix F. Feist and Al Piantadosi — well, yes, why not? This song is reminiscent of Tin Pan Alley songs from the beginning of the 20th century. I am the Conductor — I learned this song from my wonderful 2nd-grade teacher, Bernie Gittleman. It’s what we now call an “echo song” where one person calls out a phrase that is then repeated by the group. Bernie was so animated and silly when he would sing this with us. I try to channel his magic whenever I teach. I Had a Rooster — actually, I did have a rooster, two in fact, and they were very noisy. There are many farm songs in the folk song tradition. I love to teach this to my very youngest students as they all love to moo, meow , and growl. Come to think of it, so do I. The State Laughs by John Forster — follows a joke and the response it gets in different states of the country. Originally sung by Tom Chapin, I just about fell out of my chair when I first heard this. Nyuk, nyuk, nyuk! I am a Pizza by Peter Alsop — one of those songs that all pre-schoolers love. It’s the story of a proud pizza, piping hot, and a careless car ride. Sigh! The Hokey Pokey — We have so much fun with this song. It’s a great introduction to right and left sides of the body. When we’re dancing, I have the kids mirror me so now I’m trained to automatically raise my right hand when I sing “left”. It’s very confusing. She’ll be Comin’ ‘Round the Mountain — originally an old gospel song. In class we are all stagecoach drivers handling our team of six white horses, galloping around. It’s the type of controlled chaos that the children love. I Like the Mountains — I just love the feeling this song evokes. My students find it magical. In this rendition I have my very talented older singers demonstrating the beauty of this song in its “round” form, giving younger students an example of musical complexity in a simple melody. And the Green Grass Grows All Around — is a cumulative song, one that adds a detail with each verse and then the details are repeated back in reverse order. Like its predecessor “The Rattlin’ Bog” the challenge is in remembering the details, and of course, not running out of breath! I’ve Been Working on the Railroad — is actually 2 songs. “Railroad” and “Someone’s in the Kitchen with Dinah” were put together about 100 years ago. Do they make any sense together? Not really. But I always imagined that “Someone’s in the kitchen with Dinah” is about someone stoking the engine with coal or wood…and playing the banjo. I’ve been known to stop whatever I’m doing to grab my banjo and play. Listen to the Water by Bob Schneider — is another favorite of my very young children. It not only gives them an opportunity to say what they’ve notice by the water side but also what they imagine to be by the waterside — mermaids, dragons, space aliens and of course dinosaurs. Baby Don’t You Cry (The Pie Song) by Adrienne Shelly and Andrew Hollander — comes from the movie “The Waitress”. When I first heard this song I had a strong sense of deja-vu, baking with my mom, the smells of the dough and the filling coming together to make a pastry full of love. Teddy Bears’ Picnic by Jimmy Kennedy and John Walter Bratton — A surprise awaits anyone who ventures into the woods! Bedtime Round by John Forster and Tom Chapin — is another one of those songs that floored me when I first heard it. Come to think of it, it still does. I imagine tired little teddy bears trying to get to sleep after their stimulating day out, not quite ready for the day to end, and — Mom — ready to get off her feet, maybe having a nice, soothing bubble bath and a cup of tea.